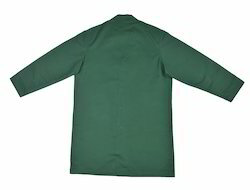 Our product range includes a wide range of industrial long coat. Industrial Long Coat is a kind of industrial aprons offering a lot flexibility in terms of length. We are offering wide variety of lengths with superb comfort ability. So long coats can be used in the industry, hospitals, cleaning department and many more like these.